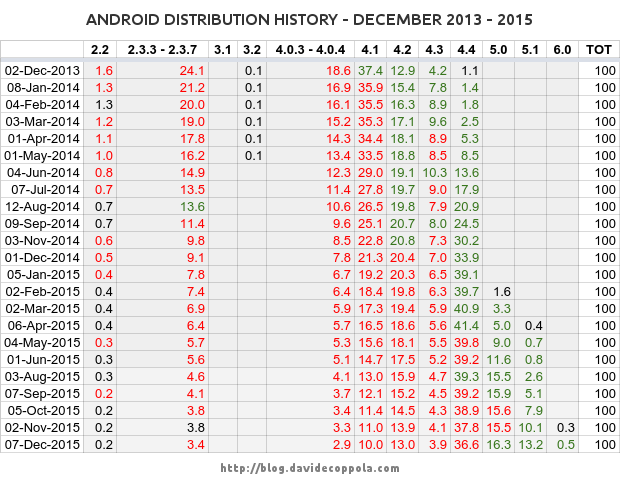 Second and final update of the year of my series of posts dedicated to tracking and analysing the Android version distribution over time. 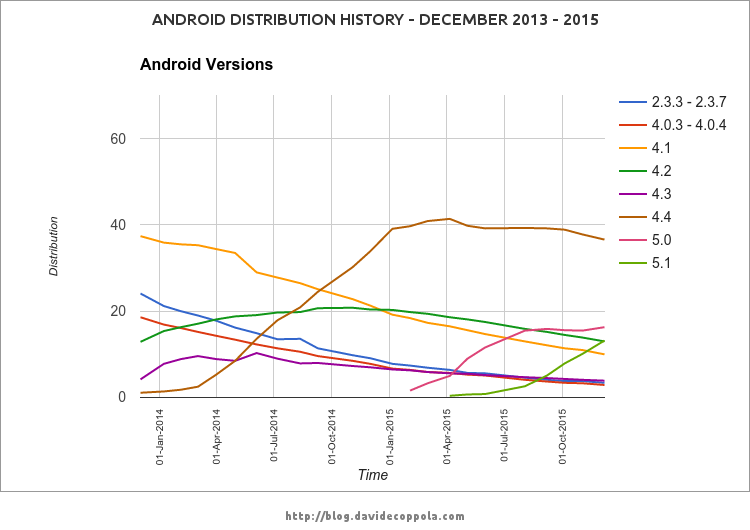 The time frame considered in this update covers the last 2 years of Android: December 2013 to December 2015 and it’s the first one with data on Android Marshmallow 6.0. 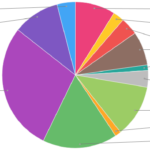 Version 2.2 (Froyo) slowly disappearing, but now it seems to be stable on a 0.2% market share. Version 2.3.3 – 2.3.7 (Gingerbread) keeps losing share, but at a very slow pace, that’s probably due to all the old low-end Android devices still using it. Version 4.0.3 – 4.0.4 (Ice Cream Sandwich) keep having a lower market share than Gingerbread and will probably disappear faster than it. Version 4.1 (Jelly Bean) keeps losing market share at a stable rate (about 1% each month). Version 4.2 (Jelly Bean) is starting to decline faster, at a similar rate than 4.1 even if it still holds a slightly bigger market share. Version 4.3 (Jelly Bean) is now slowly disappearing in a similar fashion as Ice Cream Sandwich. Version 4.4 (KitKat) started to lose market share in May this year and it’s constantly losing at least 1% per month, but it’s still the most used version of Android and it will be so for a long time. Version 5.0 (Lollipop) after a fast growth the first few months has now stabilized around the 16% mark and further growth is unlikely due to the release of 5.1. Version 5.1 (Lollipop) is showing a fast growth and will probably end up consuming most of the 5.0 userbase. 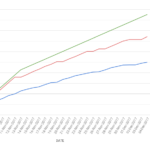 Version 6.0 (Mashmallow) was released in October and hit the charts for the first time in November 2015, but after 2 months has not passed the 1% mark yet. To have a better visual understanding of the data I have also created a graph of the evolution of the 8 main versions over the past 2 years. These are the Android versions with more than 1% of market share which overall cover 99.3% of the current Android market. Overall Kit Kat is still the most used Android version with a 36.6% of market share, but it has dropped 4.8 points in the last 7 months and it’s likely it will lose more market next year especially to Lollipop. The next update will probably be in 3 or 6 months, so keep an eye on the blog for more. For any question or suggestion leave a comment below.